Smart Banner (Banner) means an Advertisement consisting of the constant component (pattern including the information given by the Advertiser prior to the Banner placement), and the changeable component (information on Product Offers of the Advertiser’s site furnished by the Advertiser (in the FID form) for addition to the constant component of the Banner at serving of such Banner) or consisting of changeable component only. Should the Advertiser not will to serve a Smart Banner consisting of changeable component only it reserves the right to cancel such option by sending a request to the support service via the feedback form at https://yandex.ru/support/direct/troubleshooting/start.xml. Respective changes shall take effect within 7 business days from the request day. Media Context Banner means an Ad, except for an Image Ad, Smart Banner, Mobile Ad and Dynamic Text Ad (as stipulated by cl. 3.17.4 hereof), with the “Media Context Banner on search” type chosen by the Advertiser when creating such banner. Once such Ad is created, it is impossible to change its type and format. 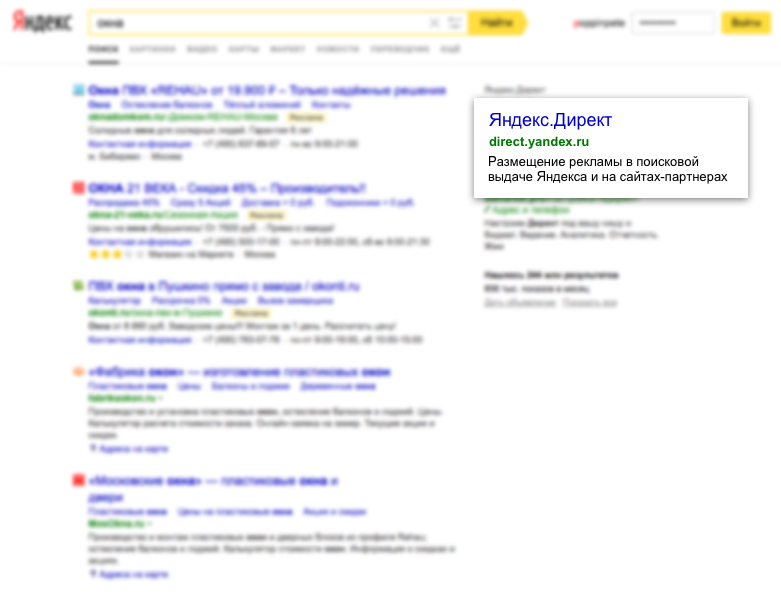 Ads of the said format are not placed on Advertising Spaces located on Yandex services adapted for mobile devices. 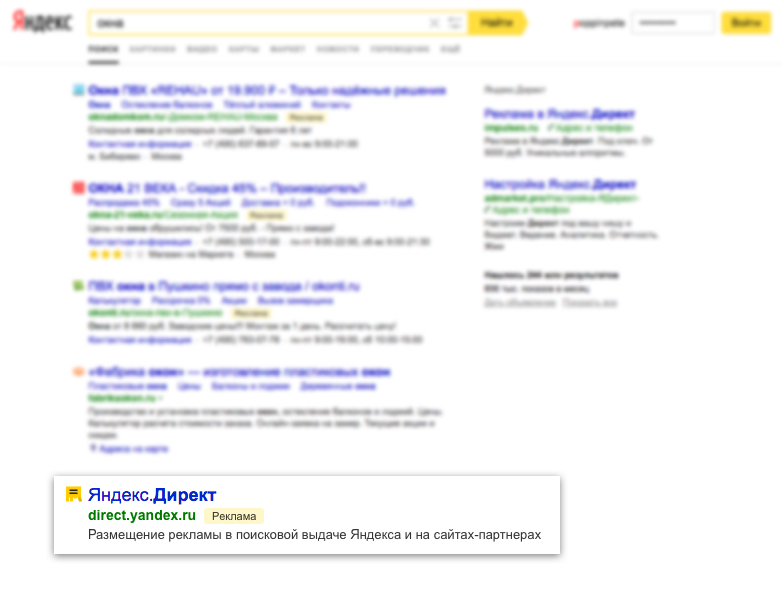 2.6. on search result pages on the Yandex partners resources ** — up to 13 ads. Smart Banner and Image Ad may be displayed as specified in 2.2 of these Rules. Media Context Banners may only be displayed on the Advertising Spaces mentioned in cl. 2.1 and 2.6 hereof. 3.2. When selecting ads to be displayed on the Advertising spaces specified in 2.1, 2.3, 2.4, 2.5 of these Rules, a key phrase/word/search query (if the Advertiser uses Autotargeting as an additional option) (without stop words (https://yandex.ru/support/direct/#glossary)) and also the Quality factor (according to the definition of this term set in 3.11), forecast CTR and Cost per Click shall be taken into account. 3.3. Up to four ads displayed on the Advertising spaces specified in 2.1 of these Rules shall be displayed as Premium Placement ads. 3.3.6. The Advertising Space mentioned in cl. 2.1 hereof mostly displays Media Context Banners whose multiplication of CTR and Cost per Click is the best. At the same time, it is possible to automatically rotate Media Context Banners on the said Advertising Space with no regard to the multiplication of CTR and Cost per Click. 3.4. The Premium Placement and Guaranteed Impression positions shall have a barrier of entry not dependent on the availability of any competing Ads. It is therefore quite normal when none of Yandex.Direct ads are displayed in the Premium Placement and Guaranteed Impression positions. On the other hand, Ads with high forecast CTR may often hit the Premium Placement at a price lower than the Cost per Click fixed for Impression on the first position in Guaranteed Impressions. 3.5. Ads displayed on the Advertising spaces specified in 2.1 of these Rules that are optimized for mobile devices shall be arranged in a descending order of the value calculated basing on forecast CTR, Cost per Click and Quality factor. This clause does not apply to Media Context Banners. 3.6. Selection of Ads for impression on the Advertising Spaces specified in 2.2 of these Rules shall be performed by Yandex automatically based on correlation between subjects of ads and the User’s interests, including basing on the data, provided by the Advertiser via “Audience” Service (https://audience.yandex.ru). By using the “Audience” Service the Advertiser undertakes to comply with the document “Audience: Terms of Service” placed on the Internet at https://yandex.com/legal/audience_tos_ch/. The functionality of “Maintain network CPC below search CPC”, described in 3.17.3 and 4.4.1 of these Rules should apply to the Cost per Click, set by the Advertiser, in case the Advertiser chooses a criterion of displaying of the Ads (if such criterion is available for choice): “Manual management” in the settings of the Advertising campaign, In this case the Cost per Click is calculated automatically with application of the above mentioned functionality. The said rule does not apply to the Image Ads. 3.6.1.1. The User will see the headline of the ad, Link and Image (according to the restrictions set in these Rules), while display of the whole text of the ad will be performed after the first Click on such ad (on mobile devices and tablets), or after moving the computer mouse cursor on such ad (on the display of the PC). The terms and conditions of this clause shall not apply to the Smart Banners, consisting of constant and changeable components. 3.6.1.2. In case it is required to Click on an ad to see the full text of ad according to 3.6.1.1. of these Rules, such Click won’t be considered for the purposes of calculation of cost of Services and won’t be reflected in the Statistics. The terms and conditions of this clause shall not apply to the Smart Banners, consisting of constant and changeable components. This clause does not apply to Media Context Banners. 3.12. Forecast CTR of an Ad shall be calculated based on the data for the last 28 calendar days, during which the Ad was displayed. The terms and conditions of this clause shall not apply to the Smart Banners, consisting of constant and changeable components. When placing ads for a relevant key word (word group), only one Ad from a group of Ads recognized as similar, - the one with the best value calculated basing on forecast CTR, Cost per Click and Quality factor,, - shall be displayed to the User. All other ads in such group shall be recognized as duplicates and shall not be displayed (placed). The Cost per Click fixed by the Advertisers for duplicate ads shall not be taken into account (in particular, when determining a place for impression of such other ads) during the entire period, when these ads are suspended. 3.15. Ads displayed on the Advertising spaces through mobile devices may contain a Link to a website and/or a Link to a contact page. When clicking on the Link, the User goes to the chat mode where he/she may in his/her sole discretion make a call at a contact phone number specified by the Advertiser for the particular Ad in a virtual business card. The terms and conditions of this clause shall not apply to the Smart Banners, Image Ads and Media Context Banners. 3.17.2. While Ad creating Advertiser is given the opportunity to apply additional functionality «Ads for Mobile Apps» that is used for creating Ads to be displayed on mobile devices on the Advertising spaces listed in 2.1.‒2.3., 2.6. of the Rules. Ads created by the Advertiser and applying additional functionality «Ads for Mobile Apps» displayed on the specified Advertising spaces may include a mobile application icon, information about mobile application, a picture and/or video and a button included a link, which leads the users who clicked on it to an information resource (web site/mobile application) on the Internet with its address (URL) stated by the Advertiser for such an Advertisement. The content of the Ads created applying additional functionality «Ads for Mobile Apps» is updated once a day. The advertiser shall control the relevancy of the Ads content and cease its impression in case that the information about the mobile application becomes irrelevant. 3.17.4. While Ad creating Advertiser is given the opportunity to apply additional functionality «Dynamic text ads» that is used for creating Ads to be displayed on the Advertising spaces listed in 2.1.‒ 2.6. of the Rules (if technically feasible). Additional functionality «Dynamic text ads» let the Advertiser to generate automatically the Ad’s headlines and the Links and to specify key words for an Ad display on the basis of the automatic analysis of content of the site specified by the Advertiser for the relevant Group of Ads. 3.17.7.1. For the purposes of creating Image Ads (subclause 3.17.7 above) Yandex may make available to the Advertiser special interface allowing creation of Image Ads (web-constructor) (hereinafter – “Ad Builder”). By creation of Image Ads using Ad Builder the Advertiser agrees that principles of ads placement, as well as technical requirements to Image Ads (including but not limited to format, size and maximum weight of the banner) shall be agreed between Yandex and Advertiser via Client web-interface. 3.17.8. When creating the Advertising Campaign, the Advertiser can be given the opportunity to use a special interface (constructor) to create contact pages in the turbo mode (hereinafter referred to as Turbo Pages), which Links the Advertiser can indicate, when it creates respective Advertising Campaigns. By using the Turbo Page constructor, the Advertiser agrees that it is responsible for making the content of Turbo Pages it created using the constructor compliant with legislative requirements, including, but not limited to requirements of advertising and intellectual property laws and personal data protection laws. However, all rules and restrictions stipulated by the Offer and the Rules for the Advertiser's website shall apply to Turbo Pages. Yandex does not guarantee error-free operation of the Turbo Page constructor. Yandex may also block the use of a specific Turbo Page or all functions for the Advertiser, if the Advertiser violated the terms of the Offer, the Rules and/or any binding document. 3.17.9. When creating an Advertising Campaign, the Advertiser may be provided with an option “Autotargeting” to create Ads placed on the Advertising Spaces specified in subcl. 2.1, 2.3 - 2.6 of the Rules. Automatic Targeting enables the Advertiser to adjust automatically the display of Ads by search queries based on the automatic analysis of Ads covered by the said option and the content of the Advertiser’s website specified for the relevant Ad. This rule does not apply to Graphic Ads and Smart Banners. 3.17.10. When creating an Advertising Campaign, the Advertiser may be provided with an option “Media Context Banner” to create Ads to be displayed on the Advertising Spaces specified in cl. 2.1 and 2.6 hereof. Media Context Banners are not displayed in Internet Explorer 6 and 7. In other browsers and other Internet Explorer versions Media Context Banners shall be displayed as usual. For services involving the placement of Media Context Banners to be rendered, the Advertiser shall provide advertising materials with all information required by Russian laws, including information specified in cl. 5.1 and 5.2 hereof. 3.18.1. if the Group involves both Mobile Ads and those that are not Mobile Ads, Ads of the first type are displayed mostly on PCs and tablets; Ads of the second type are displayed on mobile devices. If the Group involves only one type of Ads, these Ads can be displayed on any device regardless of its type. This clause does not apply to Media Context Banners. 3.21. If the Advertiser does not accept the additional functions specified in this section, the Advertiser shall contact the help desk via the feedback form at: http://feedback2.yandex.com/direct/. 4.1. If the Cost per Click fixed by the Advertiser, with consideration of the rate set by the Advertiser according to cl. 3.19 of the Rules, exceeds the amount of the Advertising Campaign cash balance/ the General account (the amount of cash balance for all Advertiser’s Advertising Campaigns) or the cost of service limit fixed by the Advertiser, the Cost per Click shall be deemed to be equal to the amount of the Advertising campaign cash balance/ the General account or the cost of service limit fixed by the Advertiser (or remaining balance thereof), respectively. 4.2. Impression of the Advertising with the pictures, included by the Advertiser in accordance with the p. 2 of art. 3,6. of the Rules, may be made upon condition that Cost per Click is fixed by the Advertiser (with consideration of the rate set by the Advertiser according to with cl. 3.19 and 3.17.1 of the Rules) at a level not less than the value set forth in the table on page https://yandex.com/legal/direct_table_ch/. The minimum Cost per Click for the Smart Banner shall be equal to the minimum Cost per Click for ads containing pictures included by the Advertiser. 4.4. When displaying ads for automatically specified synonyms of key words/phrases selected by the Advertiser, and if the Advertiser uses the “Impressions for Additional Relevant Key Phrases” option, the Cost per Click shall be set automatically based on the Cost per Click set singlehandedly by the Advertiser. In this case, the Cost per Click set in the above manner cannot exceed the maximum Cost per Click set singlehandedly by the Advertiser for the keyword phrases of a correspondent Group of Ads. 4.4.1. 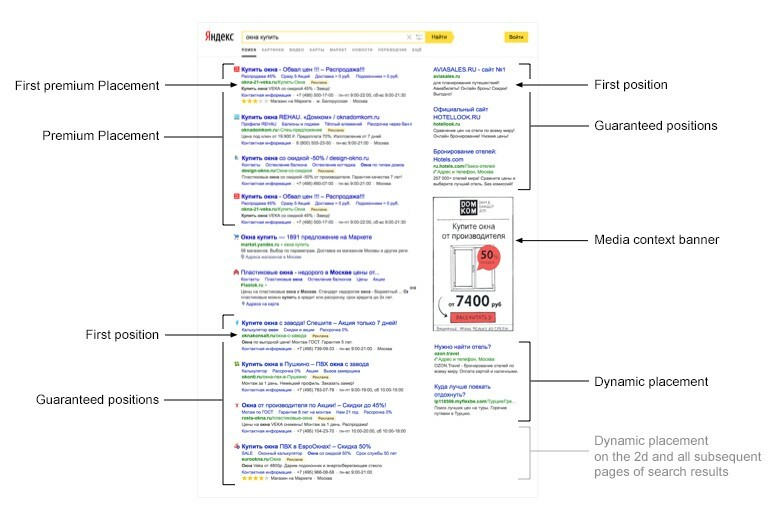 When applying the functionality “Maintain average network CPC below average search CPC” by the Advertiser (not applicable to Media Context Banners), the Cost per Click is calculated for the key phrase within the Group of Ads automatically, taking into account the maximum Cost per click, set by Advertiser directly. In this case the automatically calculated Cost per Click for impression on Advertising spaces listed in 2.2 and 2.7 of these Rules, could be less than Cost per Click, deducted from the Advertiser for the impression on the Advertising spaces listed in 2.1, 2.3, 2.4 and 2.6 of these Rules. The above warnings shall be added to Ads automatically by determining themes of Ads and/or via the customer support service using the feedback form at http://feedback2.yandex.com/direct/. In this respect, if Image Ads are placed, the Advertiser shall provide the said Ads with warnings already included pursuant to this cl. 5.1 of the Ad Serving Rules (including by creating ads using Ad Builder). The Advertiser shall ensure that themes of Ads are determined properly and the required warnings are unfailingly added to Ads with themes in question. The category of the content shall be determined by the Advertiser independently during the ad production by selecting the appropriate category through a Client web-interface or, if it is an Image Ad, by indicating the category in such an advertisement, or via Ad Builder. If the Advertiser fails to select a category for ads with relevant content, the ad shall be automatically assigned to the 18 + category, except for Image Ads. As for Image Ads and Media Context Banner category, the Advertiser shall independently add the content category (including by creating ads using Ad Builder). The assignment to the relevant category shall be performed on the basis of automatic identification of theme. 5.3. If quick links (additional links that may be shown when an Ad is served) have been filled in for an Ad by the Advertiser, they shall be shown together with the Ad displayed in the Premium Placement and may as well be shown when the Ad is displayed in Guaranteed Impressions on the Advertising Spaces specified in Clause 2.1 of the Rules when ads are displayed below search results, as well as in the other positions/on the other pages specified in Clause 2 of the Rules. The said rule does not apply to the Image Ads. This clause does not apply to Image Ads and Media Context Banners. 5.3.1. Also if the advertiser fills a description of all filled quick links in the Ad such Ad with quick links and description to them shall be shown when placing the Ad in Premium placement. 5.7. In order to improve the quality of Yandex.Direct system and its services, and to develop new offers for the Advertisers, Yandex may periodically carry out experiments. In the course of such experiments, Ads displayed on personal computers and mobile devices of certain Users randomly selected by the system and/or search requests may be displayed on the Advertising spaces subject to modified conditions of geo-targeting (for example, based on the region specified in the User’s search request) and condition of the Impressions of Ads including but not limited as to selection and arrangement of Ads as compared to those specified for the Advertising spaces in these Rules. While carrying out an experiment, Yandex does not guarantee that each and every Ad will be displayed in compliance with the order of placing Ads on the Advertising spaces, and selection conditions specified in clauses 3 to 5 of these Rules and in compliance with the geo-targeting conditions and other provisions specified in these Rules, also the Impression of the Ads may be accompanied by additional information material of the Yandex Services (such as marks of the goods/shops, comments concerning the goods/materials, but not limited), as well as data/information specified by the advertiser while preparing the Advertisement in the client web interface or provided to Yandex by any other agreed means. However, the experiments will not affect the Cost per Click fixed by the Advertiser in accordance with clause 4 of these Rules and will not change it in any way. Payment for the Services shall be carried out based on the Cost per Click determined in accordance with clause 4 of these Rules. Any information about the fact of running such experiments shall be made available to the Advertiser upon its request sent to the customer support service using the feedback form at http://feedback2.yandex.com/direct/ specifying the reason for its submission and the number of relevant advertising campaign. on the Advertising spaces specified in 2.2, 2.3 of these Rules by adding the relevant website address and/or mobile app identifier and/or ad exchange to the list of prohibited advertising sites in the advertising campaign parameters or by imposing a display prohibition with respect to a particular website or mobile app identifier on the sites statistics page (https://yandex.ru/support/direct/efficiency/statistics.xml). 5.17. 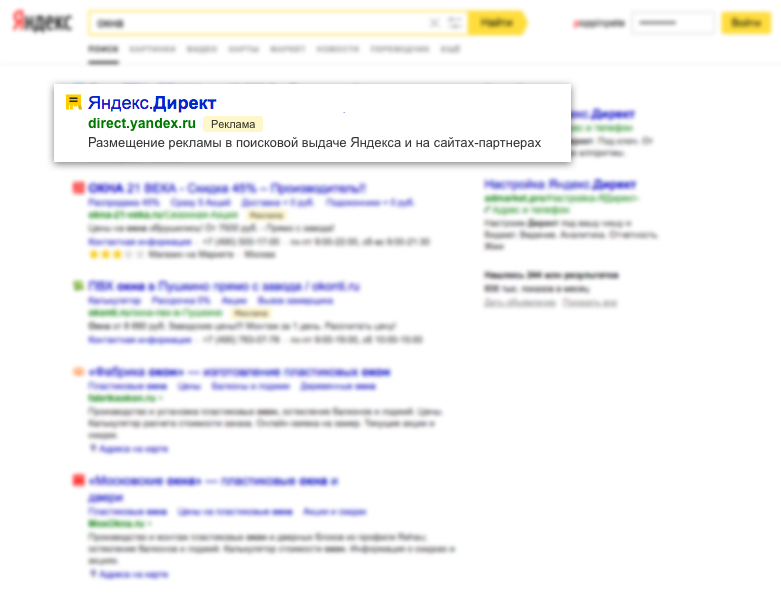 The Advertiser hereby agrees that in case the Ad contains the Link to the contact page (virtual business card), the information on such contact page (virtual business card) could be used by Yandex to perform automated matching of such information with information about the companies available on the “Yandex.Directory” (https://sprav.yandex.ru) (“Directory Information”). Placement of the Ads on the Advertising Spaces specified in the clause 2.4 of these Rules could be accompanied by the Directory Information automatically matched by Yandex according to the provisions of this clause, including but not limited to: photo of the respective company, panoramas, reviews of the company, rating/number of the reviews, category/rubrics, the nearest metro station (if applicable), additional characteristics of the company (average bill, wi-fi and etc.). This functionality could be activated for the foregoing type of Ads by default provided that Yandex will notify the Advertiser about such activation via Client web-interface. The functionality could also be activated by the Advertiser by selecting respective check-box in the Client web-interface. In any case the Advertiser undertakes to ensure that the Directory Information is correct and legally used. The Advertiser also undertakes all obligations and warranties provided by this Offer in respect of the use of the Directory Information in the Ads. The Advertiser may cancel the application of the foregoing functionality by using special check-box in the Client web-interface.